Large Lakeview Model in desirable Lauderdale West community! 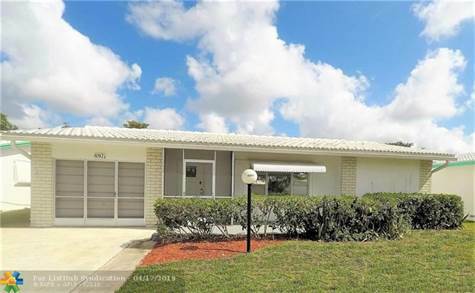 The home features split 2 bedrooms with walk-in closets, 2 full baths with family room plus extra-large Florida room and a 1 car garage single family home. New kitchen appliances and newer AC system with full sized Washer & Dryer. Maintenance includes pest control, lawn care, repair/replacement of roof, exterior paint, minor plumbing and electrical repairs, and cable. Community offers 2 pools, tennis, fitness center, courtesy bus, entertainment, and more. Price Includes New Roof currently in the process of installation. 55+ community 20% down payment required by HOA. Pets allowed with doctor's note.